Photo 16. View south from Gop Hill, just above the village of Trelawnyd, near Prestatyn. This area, at the northern end of the Clwydian Range hills (seen in the distance) is scattered with several similar hills which rise to about 200-250m (e.g. Axton Hill, Bryn Digrif, Glol, Coed y Garreg and Pen-y-gelli), whilst the surrounding elevated plateau only lies at about 150-180m. 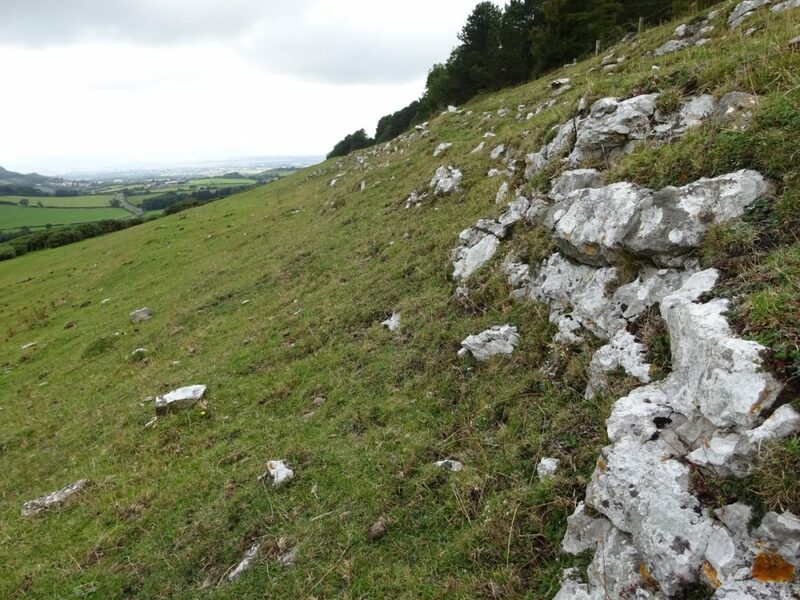 They are formed from reef and platform limestones, similar to those we’ve seen further south in the Loggerheads escarpment and lower Clywedog/Clwyd valley. They probably formed the northern reef/platform margin in Early Carboniferous times, with deeper water facies of thinner, darker limestone turbidites and muds dipping away north and east into the deeper offshore waters of the Craven/Irish Sea Basin. Photo 17. The southern slopes of Gop Hill, looking west. This image clearly show its constituent reef/platform limestone beds. Photo 18. A small abandoned limestone quarry near the A55 at Coed Pen-y-gelli, just west of Holywell, shows a better section through the massive limestone beds typical of Lower Carboniferous reef/platform carbonates. Similar facies are found along the margins of many land masses, or submerged fault blocks in Britain during the Early Carboniferous period, when Britain was located in the tropics. They were able to build upwards (aggrade) and/or outwards (prograde) as sea levels fluctuated at the time.